Lighting Charcoal? Keep it on Dutch Oven tables for a safe and sturdy surface. The charcoal chimney starter is a great device to use to get your charcoal started, whether you want the charcoal for starting a charcoal grill or cooking in your Dutch Oven, but it is very important that you carefully choose where you are going to set it up and light it. If you are not careful where you light it, it can set fire to or damage whatever is underneath it, including grass, concrete, or the campsite table. The safest way to use your chimney charcoal starter is on a charcoal table, more commonly called a Dutch Oven table. This is a flat table, raised off the ground at various heights depending on the table, which provides a fire-proof surface for you to light your charcoal chimney and to use your Dutch Oven. Dutch Oven tables provide you with several conveniences. First of all, and very important...you don't have to bend over constantly to stir or check on your Dutch Ovens, if that is what you are using to cook. The table raises everything to a comfortable height for you. The safety issue is a big factor. 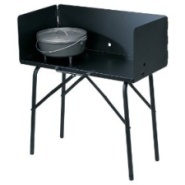 Dutch Oven tables provide you with a safe place to set up your chimney charcoal starter without any concern of setting anything underneath it on fire. A well-made Dutch Oven table will take the heat and not burn. 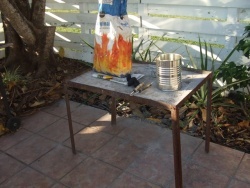 You can dump your hot charcoal right out on the table without worrying anything will catch on fire. The charcoal table can be used as more than just a Dutch Oven cooking table. Use its surface to start a small wood fire, rather than a ground fire, for toasting marshmallows or roasting hot dogs. And you don't have to use your charcoal table just for charcoal...it easily handles the heat and weight of your camp stove or a small charcoal grill, and once again, brings it up to a comfortable height for you to work on without having to worry about burning the surface underneath. Use your chimney charcoal starter to get your coals going, right on your table, and place your charcoal grill right on the table next to it...when the coals are ready, just dump them into the grill, all on your safe working surface. If you are handy, you can build a Dutch Oven table. We have two homemade Dutch Oven tables. The large one on the left has a roomy surface area and holds several Dutch Ovens in addition to our chimney charcoal starter. The smaller one on the right, as you can see, is big enough for just one Dutch Oven or our charcoal starter, and when we are traveling, it nests perfectly right underneath our larger one. These were made from scrap metal and are close to ten years old. As you can see, they are very very worn and weathered, from years and years of use. Now we are looking for a new one and have decided to purchase one this time. Years of use as well as years of transporting our Dutch Oven tables on camping trips have given us a good idea of what we will be looking for in our charcoal table. Height: Charcoal tables come in different sizes. There are small tables that fit just one Dutch Oven, that simply elevate the pot off the ground or the table a few inches. This might work fine for your needs. It was fine for us when we were younger. Now as we are not in our agile 20s anymore, we prefer the table to be at a comfortable height for our backs...so we don't have to bend over. Portability: If you are going to be bringing your charcoal table to your campsites, as we do, it should be easy to pack and take with you. This is one thing our homemade version doesn't have..the legs have to be bolted and unbolted if we want to remove them. The better models feature legs that fold down flat. 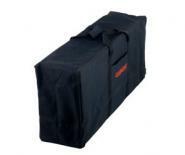 There are also carrying cases made to fit the tables so you don't get your vehicle all dirty with ash and soot. Size: This is going to be a personal preference. You may want a small square of a table that holds one pot and merely protects the surface underneath your oven, chimney charcoal starter, or stove from the heat. Or you may want one big enough to hold your camp stove and a Dutch Oven or two on it. Our preference is for a large work area, 32" or 38". Windscreen: While not a necessity, it is a nice convenience and many models have a built-in windscreen to protect the coals or flame from the wind while you are cooking. Sturdiness: This is very important as far as a safety factor is concerned. You certainly don't want a thin piece of tin that will collapse under the weight of your dinner! Look for a sturdy steel table that can handle some weight on it. that is put together properly and will not wobble. 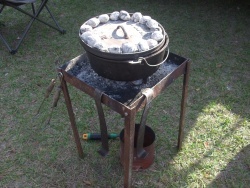 One of the Dutch Oven Cooking tables we like is the Camp Chef Camp Table. It comes in two sizes, 38" (the one we have chosen) and 32". The main difference between the two tables is the surface area. 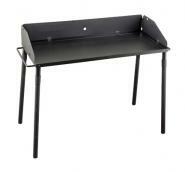 Both sizes of this table are made of sturdy steel covered with a coat of black powder coat paint. It has all of the above features we were looking for. It brings the work surface to us to a comfortable height of 26", which makes it easy to work on. It has a windscreen on three sides, to help prevent the charcoal from blowing around as it ashes, or to burn faster due to the wind being on it. Finally, the legs are removable to make it easy to transport to campouts. The 38" table will hold two 16" Dutch Ovens or three smaller 12" Dutch Ovens. The 32" will hold two 14" Dutch Ovens. And of course there is plenty of room for your charcoal chimney. Camp Chef also makes some accessories to go with your charcoal table. 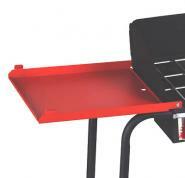 The carry bag makes it easy to transport your charcoal table when it is broken down. There are also attachable shelves for the 38" model. The shelves come in a set of two that install on either side of the table, and add to the size of your work area. Use them for serving, or to keep your condiments and spices handy while you cook, or as an additional prep counter. Another quality Dutch Oven table is made by Lodge, the same people that make our favorite Dutch Ovens. The Lodge Dutch Oven tables are also made of rugged steel and are at a comfortable 26" working height. The windscreens on this charcoal table are 12" high all around, a little higher than the Camp Chef table, and are removable for storing and transporting. 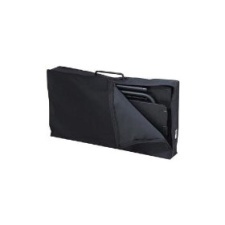 The legs fold down as well, for easy portability. Lodge also has a carrying case that fits your Dutch Oven table when it is broken down for transport.